I gained a BSc. in Environmental Biology and Geography (joint honours) and an MSc. in Managing Environmental Change from St Andrews University, Scotland. On completion I established a conservation volunteer programme on the Alladale Reserve in the Scottish Highlands. I ran this programme for two years leading volunteers in activities such as tree planting, red deer management, GIS mapping and wild boar (Sus scrofa) behavioural monitoring. 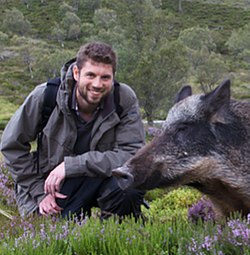 I then began the research for my PhD with WildCRU in 2007, studying wild boar as a conservation management tool to aid the re-establishment of the Caledonian Pine Forest and control bracken on the Alladale Reserve. I’m also a keen photographer specialising in landscape and wildlife photography. The Highlands offer ample opportunity, especially with the boar, European elk and Highland cattle on site. The hills keep me fit during my field season and I play rugby over the winter, representing my college team (Trinity/LMH).